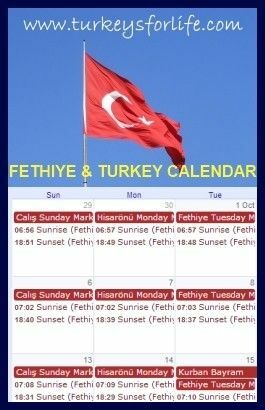 The mild winter has meant that Spring has sprung early in Fethiye. And, whenever that happens, it’s nigh on impossible for us to walk along Fethiye harbour or along the kordon of Çalış Beach without being tempted by one of the many bars and restaurants. It’s pleasantly sunny, the sea’s gentle ripples lap against the shore, people are sitting and chatting and laughing (because aren’t we all in a better mood when the sun shines)? Beer, wine, çay and coffees are flowing. The days are still short and the nights cold – so we all want to make the most of the afternoon outdoor temperatures and life feels good. And, as is the case with other places along the beach, Lighthouse Restaurant is just one of those places where we’ve never thought to park ourselves. Lighthouse Restaurant is new – for us. It has lots of seasoned regulars. We’ve glanced inside as we’ve ambled by – of late. It’s always looked so bright and airy. Vivid colours furnishing the space. Exactly the type of space I love. We’d spotted that the menu (a huge board outside) was now focusing on pide and pizza. Prices were reasonable. But familiarity and habit draws you to more regular haunts, so we’ve always just continued along to Bahane and other places. Lighthouse Restaurant in Çalış has a real seaside feel to it, with boarded flooring inside and out. And the floor-to-ceiling sliding windows that mean the outside comes in if it’s a bit too cold to sit outside. On the day we went, there was a smattering of people sat outside in t-shirts, soaking up the rays. But, whether it’s a case of being in Fethiye for so long and therefore feeling the cold, or whether we’re just being big softies, we sat inside, sheltered from that early spring bite in the breeze. Simple is best. The opposite side of the menu is in Turkish. After pondering the interesting spicy courgette option as a pide topping, kavurma suddenly jumped out at me (the menu in the photo above is the translated English version – you’re looking at ‘braised’). Courgette will have to wait for another time. Tender chunks of meat won the day quite easily. We ordered drinks, ordered our food and then waited expectantly, hoping the pide was going to be as good as the lahmacun had looked. And we weren’t disappointed when the pides were delivered to us! An oblong canoe of hot, thin crispy dough, topped with herbs, chopped tomato and chunks of braised meat (kavurma), served on a long wooden board. What a lovely sight! And, as we looked down at the size of the pides that had just been given to us, the portion of chips we’d ordered – that weren’t even on the menu – all of a sudden looked a bit lonely and redundant. Were we really going to need chips with all that pide and salad? We set to work with the chilli flakes; a good liberal, yet careful, sprinkling, making sure each slice had an even crimson cover. For us, a pide without chilli flakes, especially a meaty pide, just isn’t the same. It’s worth spending a minute or two making sure of a good even coverage. Needless to say, we worked our way through our rather large helpings of pide, and the salad. And those chips that we all said there was no way we would eat; they went, too. It’s great to have another pide option like this along Çalış Beach. We love the pide at Güven’s but sometimes we can’t get it in winter. And we love to go to Pizza Calisto for a ginormous, super spicy Mexican pizza occasionally, too. Now, Lighthouse Restaurant can be added to the pide/pizza tally. And we weren’t finished there, either. The sun was hitting the glass windows and we were toasty and warm, enjoying the sea views but sheltered from the breeze. We ordered another drink and indulged in katmer. Well, there were three of us so it wasn’t too naughty, sharing one between us. Katmer is a sweet dish, usually to be found in villages as part of a Turkish village breakfast or a snack. We’ve eaten katmer in Kayaköy in the past but have never seen it along Çalış Beach before. Tahini, honey and walnuts – a perfect combination. We took our time over our shared dessert as it’s rich and filling, and we even left a morsel, too. No more room in any of our bulging tummies. We’ll definitely be back at Lighthouse Bar along Çalış Beach, sometime soon, though. A happy part of life in Turkey is having a good-sized bank of pide options. Lighthouse has been added to our bank. And actually, what prompted this post was our photo of the kavurmalı pide that you can see above. And an update from the very same month. We couldn’t resist returning to Lighthouse Restaurant and, we did mention they were doing güveç dishes, now. Well, we don’t want to be boring and plump for the same food every time so Barry went for the kiremitte köfte (mini beef pates baked in a clay pot with a tomato sauce and roasted peppers). Mmm, apart from the salad, of course, all of this is served straight from the stone oven in the restaurant. Hot, homemade lavaş bread just waiting to be dipped into the cheese and tomato for the köfte. An individual salad, too, and all the dressings and additions (olive oil, nar ekşisi, chilli flakes) brought to the table. A lush lunch. But if you can manage to eat the lot, then you’re not going to need much else for your evening meal, are you? Oh, and it’s not expensive, either. Happy days! Lighthouse Restaurant is along Çalış Beach. At the main beach entrance, take a right and it’s around half way down. Hotel Bahar is directly behind it. 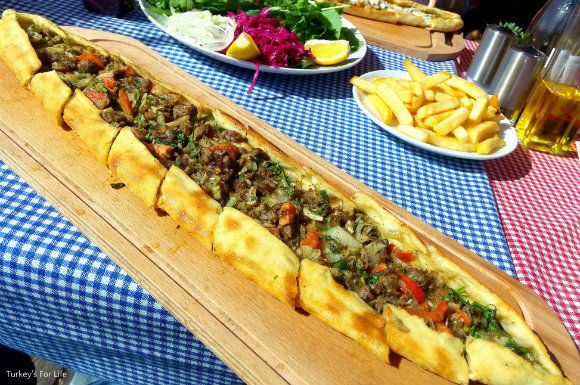 Our pide was served with a large, complimentary side salad. If you know us, you’ll know we’re big advocates of real, homemade chips. As you can see in our photos, the Lighthouse chips are not homemade. However, they are also not on the menu. We were cheeky and asked for them, so no complaints. We asked; they provided. We’ve added Lighthouse Pide & Pizza to our eating and drinking ideas in the Fethiye area. Not a definitive list – just a good few suggestions. 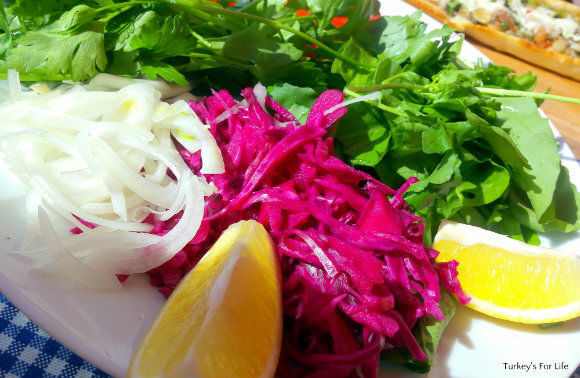 Oh, yeah, you do get red cabbage on the boats, Budget Jan. 🙂 Love it when you get a salad with your pide and this Lighthouse Restaurant salad is really simple and fresh. now that really is one to keep in mind on the odd occasions when we are over that way. Seeing that menu makes my mouth water. How come all the Turkish pizzeria owners in Copenhagen insist on making Italian food instead of focusing on something as great as lahmacun?